Blankets! Squirrel tails! Pickled snakes! Hair analysis galore! All this and more is presented in the third and final episode of our series on the Eyeball Killer. And Shea covers a Good News story out of Midland of a lost little girl and her search to find the man who saved her. 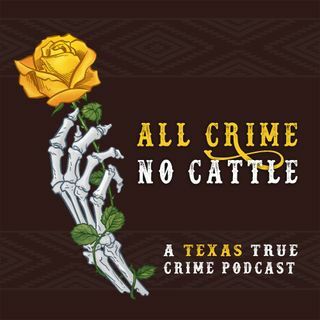 Visit our Patreon page to support the show and earn some awesome rewards: https://patreon.com/allcrimenocattle. Check out our merch shop: https://allcrimenocattle.threadless.com. Find us on Twitter: @ACNCpodcast and on ... See More Instagram: @allcrimenocattle. Tip Jar: https://paypal.me/allcrimenocattle. And always remember: crime is bigger in Texas, y'all!